Had a chance to chat to Associate Professor Phillip Dawson after his session at the ACER Designing the Future of Assessment Research Conference. Phil is from the Centre for Research in Assessment and Digital Learning (CRADLE) at Deakin University and spoke about Hacking Assessment. He gave a summary of old threats to the integrity of assessment like copy and paste and relatively new and accessible threats like buying essays, ghostwriting and reverse translation. 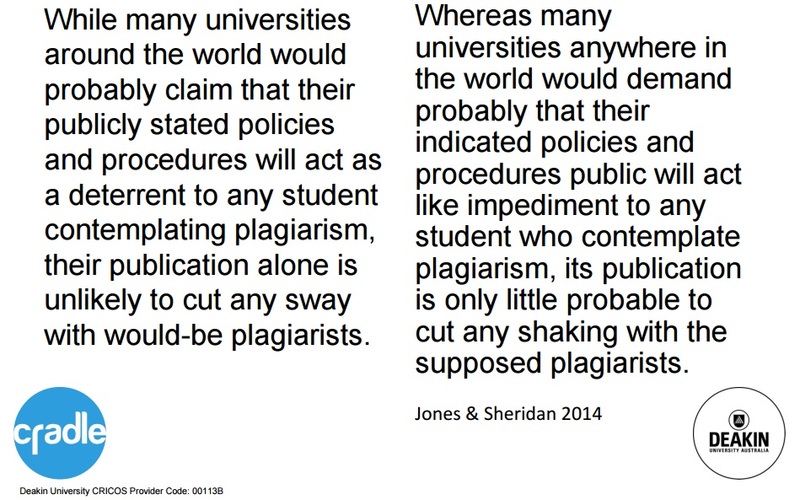 Whether schools like to admit it or not, plagiarism and cheating is rife in schools, and this brings into question whether it is the accessibility of technology that is facilitating this, the pressure of expectation on students or whether it is the low level nature of the task. Whilst Turnitin can act as a deterrent and detect many attempts at plagiarism in essay-based assessments, savvy students are turning to tricks like reverse or back translation. This involves taking a body of text (see passage to the left of screen) and using Google Translate to translate it into a different language (see second passage from the left in Spanish). This is then fed back into Google Translate and translated back into the target language (see passage bottom right) and see how it differs from the original. If something is easily googleable or can be outsourced to the lowest bidder, is the task worthwhile? Phil asked us to consider a future where that in making a task harder for copying, ghostwriting of cheating, can we not make it better for learning? A series of studies on delayed gratification in the late 60’s brought young children into private rooms and sat them down in front of a marshmallow. Researchers offered the children a deal: they could have one marshmallow straight away, or they could wait a certain time and then have two. You can watch a re-enactment of the experiment below. The children were then followed periodically throughout their lives — the group who waited patiently for the second marshmallow succeeded in whatever capacity they were measuring at the time, lending evidence to the fact that being able to delay one’s gratification can have a significant impact on future success. With the ubiquity of the web demanding a personal level of comfort with distraction and an ability of manage cognitive load, I wonder about the effects of social media in schools. When we talk of blocking social media I fear that what we are actually doing is denying students the ability to develop the willpower to delay gratification. I’m not a social media evangelist. I hardly use Facebook but the reality is that these platforms are de-facto extensions of our collective identities and demand our attention. Many schools have in their vision statements something about personalized learning or having students take greater responsibility for their own learning. In the case of Facebook (or any other social media platform), students need to be able to learn how to manage their attention and I think that the best place to do this is under the guidance of their most readily available mentor – their teacher. A successful friend and entrepreneur, who I respect and admire, asked me today how I lead within a large educational organization. What was my philosophy? I responded that it was an incredibly nuanced and contextual approach. Whilst I was a devout student of Kotter, I’d like to think my style incorporated an awareness of my own shortcomings as a leader and that I try and address these on a daily basis. At the same time, I recognize that I can’t be all things to all people, so in that sense I just try and be myself. The importance of having others around you that compliment your own skill set can not be underestimated. This is the essence of a highly functional team. To lead is to really cultivate this team, to grow and encourage those around you to ensure a diverse and skillful group of people. I also have a relentless focus on the core business of a formal place of learning; learning. Not politics, not policy and not other perceived pressures, but constantly asking others around you “what’s the most important thing that we need to focus on?” That’s the non-negotiable. Learning. It should be the crux of all conversations and decision making within an educational organization. It definitely helps to have a co-constructed vision and to enable Departments within your setting to engage in co-visioning. In the busyness of school it requires a sustained focus to maintain this vision, and the foundation of this focus has to be the people within your organization. Trying to physically show that you value everybody’s work isn’t always easy when driving change, but it is necessary. Relationships allow you to achieve your goal of focusing on your core business. Learning. I do. It is something that I have been trying to improve lately by employing simple strategies like asking more questions (rather than simply providing answers), constantly asking colleagues for advice, and having a peripheral sense of empathy. Seeking advice is one easy way of establishing relationships in any environment. By seeking advice we communicate that we respect and admire others’ insights and expertise and subtly invite that person to make a commitment to us. It says to that person that you are open to different perspectives, are considered and that you create opportunities for others to contribute and to lead. I am by no means an expert but as I develop I am finding a combination of powerful and powerless communication techniques like hedges, tag questions and intensifiers are all great ways to earn respect and influence by inviting others into the conversation. Adam Grant in his book Give and Take: Why Helping Others Drives Our Success explains three broad styles of interpersonal dealing: Taking, Matching, and Giving. Takers are those who try to take more than they give. Matchers are those who try to give and take equally for their own best interests. Givers are those who give more than they take. Grant states that “it’s possible to track the flows of energy through networks by rating interactions (between nodes on the network) on a scale from strongly de-energizing to strongly energizing.” This is true from my experience. Takers are like black holes that have a gravitational pull that others around them feel. Givers on the other hand inject light into a situation or organization by shifting their frame of reference to the recipients perspective. When we try and understand others’, we can make the mistake of staying within our own frame of reference and asking ourselves “How would I feel in this situation?” Switching reference frames requires us to ask instead “how would this other person feel?” This is a subtle but important shift. I used to love explaining reference frames to students as a precursor to the study of Einstein’s Special Relativity. A reference frame is simply a framework that is used for the observation and mathematical description of physical phenomena and the formulation of physical laws, usually consisting of an observer, a coordinate system, and a clock that could assign times to positions. As part of that discussion I used to show the 1960 film below created by the Physical Sciences Study Committee featuring University Physics Professors Patterson Hume and Donald Ivey. It’s brilliant and explains why we need to have peripheral empathy and be able to escape our own reference frame when interacting with others.